One person has died and three people are injured after an unexpected avalanche on a marked ski slope at a popular resort in the Swiss Alps. Hundreds of rescuers searched through the night, but called off the search Wednesday morning after no-one was reported missing. A 34-year-old French national died in hospital, Swiss police said. The avalanche was unusual in that it fell on a popular, marked slope when the avalanche risk was deemed low. Most people caught in avalanches are skiing "off-piste", away from the slopes maintained by ski resorts and used by the majority of tourists. Such slopes are usually very safe, as the snow around them is carefully monitored and managed to avoid risks. It happened in Crans-Montana at about 14:20 local time (13:20 GMT), when the avalanche engulfed 400m (1300ft) of piste marked out for skiers, local police commander Christian Varone said. The dead person had been working in Crans Montana's ski patrol service, police said. This was the avalanche that was never supposed to happen. Alpine villages, roads, railways and ski runs are all extensively risk mapped. Skiers caught up in avalanches tend to be off-piste, but this snow slide hit the lower stretch of a very popular slope. It is too early to determine the cause, but serious questions will have to be answered about alpine safety. It is half-term across much of Europe and the ski slopes are crowded with families. Eight thousand people were on Crans-Montana's slopes when the avalanche struck. An official investigation, involving rescue services, but also, significantly, weather experts, is already under way. Just a few weeks ago there was heavy snow across the Alps, but the last few days have seen strong sunshine. Some are already asking whether this avalanche, unthinkable for many, might be connected to climate change. In the initial aftermath, Mr Varone told reporters that witnesses said there may have been other people buried, and a major search and rescue operation was launched. About 240 rescuers continued to search the scene, aided by dogs and helicopters. But after failing to find anyone, and in the absence of any missing persons reports, the search was abandoned on Wednesday. Officials said they were ready to resume the search if necessary. 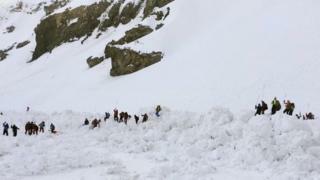 Valais Public Prosecutor Catherine Seppey has opened an investigation into the reasons behind the avalanche. Ms Seppey said it was not clear if the incident was triggered by skiers or by weather conditions. Temperatures in the area have reportedly warmed in recent days, causing some snow to melt. Crans-Montana is set to host two women's World Cup races this weekend.